Glib and a bit suspect. (“Au contraire, mon frere,” someone will comment, “what about “George Jackson", “Hurricane” and …uh…“TV Talkin’ Song”?”) However, it is true that his Dylan, the old black and white, finger-pointin’ Dylan of '63-'64, turned out to be just a fleeting facet of the man. My own Dylans are a hopeless mish-mash. At the age of ten “Gotta Serve Somebody” played alongside “You Don’t Bring me Flowers Anymore” and “I Will Survive” on my cheap transistor radio. At eleven, a cassette of Greatest Hits smeared together the earliest Dylans for an awkward pre-adolescent. Following a plunge into fundamentalist Christianity, I bought a used LP of Saved and topped it off with the, then-current, Knocked out Loaded. That duo – a gospel album and a hodgepodge – cooled me on Dylan for years. But, much later, I came back, and devoured his entire catalog – finding the wheat even in the chaff-ridden albums. I concluded that with each Dylan being rewarding (even if some are much less so) that picking a single favourite is an affront to the man's work. However, pushes turning to shoves, that stark, earnest, tune-pilfering Dylan of the early sixties is damn compelling for me. This is the Dylan of my father (a man who has ignored Bob for forty-some years yet can still recite whole verses of “The Times They Are A-Changin'”). One crucial favourite of this era is “When the Ship Comes In” from The Times They-Are-A-Changin’. This hard-charging battle anthem seems to be about civil right but is in fact all about personal indignation. 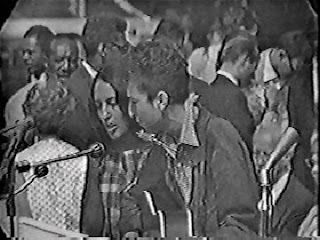 Joan Baez says after Bob, in all his scruffiness, was turned away from a hotel he wrote the song in a fury. It’s a short jump from the belligerence of this song’s, “Then they'll raise their hands/Sayin' we'll meet all your demands/But we'll shout from the bow your days are numbered” to “Positively 4th Street’s”, “You got a lotta nerve/To say you got a helping hand to lend/You just want to be on/The side that's winning”. That anger, open or hidden, is one of the many constants in all of Dylan's guises. In the end, each of the facets are of a piece; there is no Dylan but Dylan. * Hemispheric bias duly noted. Here for your listening pleasure, possibly, are twenty two different versions of "When the Ship Comes In." In 1963 at Carnegie Hall Dylan gave one of those the rambling introductions (“There are crueller Goliaths…”) that would later get him in trouble and then tore into the song, throwing a punk snarl into the consonants. Video (March on Washington) here. The phoniness that oozes from the living corpse named David Crosby may taint the Byrds for some but Chris Hillman, on the other hand, has a history including once leading this sterling bluegrass band (alongside future country star Vern Gosdin) who in 1964 effortlessly thrust the song back to another time and geography. Bragg's recent version of the song gives it a slightly mournful take, akin to Dylan’s later-period sad readings of “The Times They-are-a Changin’”, which is a shame as the world could use a clanging solo-electric guitar version like Bragg did for that damn "Times...." song. That hammy introduction (“You never thought you’d hear Dylan with an Irish accent did you?”) for this version of the song from 1992's 30th Anniversary Concert reminds us that the Clancy’s are actors who bring a broad, theatrical feel to the song, perhaps bringing the song back to it’s roots in the song “Pirate Jenny” from Bertolt Brecht’s Three Penny Opera. Video here. While this band, led by former Long Ryder and author Sid Griffin (who did justice to the Clash's “Something About England on the Sandanista Project - previously) may not have created the lost Byrds version they aspire to this 2001 version still stands as a fitting tribute to Chris Hillman's take on the song. Le Jour où le Bateau Viendra is a translation by French, (“French from France” as a good Franch-Canadian would specify) singer and Dylan pal, Aufray who gives the song a more heroic but still faithful read. It’s 1979 – the Clash have unleashed London Calling, Daniel Amos are preparing to break Christian rock free of the Eagles grasp with Horrendous Disc and somewhere there still existed this freeze-dried Mighty-Wind Christian folk band (not-to-be-missed album available here) full of banjo and church-choir break-it-down sections. In 2002 this East Coast Canadian folk duo did a fine accordion and tin whistle take on the song which has clearly become a Celtic standard thanks to the Clancy Brothers. Totta Näslund, a veteran Swedish rocker, died of liver cancer in 2005 just before finishing an album of Dylan songs including this one of When the Ship Comes In (apparently a Euro-Dylan favourite) translated to Swedish (as När Vårt Skepp Slår Til) with Mikael Wiehe. Hampered a bit by trying so hard to sound like their earlier selves, this Shane McGownless-less, but Joe Strummer-fortified (previously), version of the Pogues circa 1996 do get the closest to doing a punk rock version of this song (albeit with heavy tin whistle). Like many Roky semi-bootlegs, this rough demo of uncertain date sounds like someone paid a derelict a mickey to sing into an old boombox. Yet, in his madness, Roky gets an apocalyptic death grip on the song that both Brecht and the Dylan of ’64 would understand. Y’know, Barry gets a lot of grief for Green, Green, Eve of Destruction and a batch of tepid Christian folk albums (including this one from 1995) but that gritty voice is a biting instrument that can give strength to even his, almost invariably, weak material. Here, in all its shambolic glory is the Live Aid version from 1985 with the rambling, heretical, introduction that kept Dylan on the outs with the cultural cognoscenti for a decade. In all fairness, Bob Geldof had it coming, as does anyone else who thinks that Dylan meet will meet their expectations. Video here. 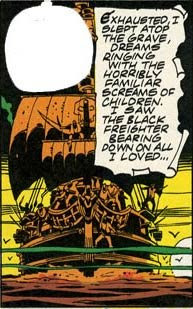 ten is called "Two Riders Were Approaching" after the final line of "All Along the Watchtower". I hope you don't mind but I included the post, with FULL props given, in a piece I was writing about this classic track! Should you mind, however, no worries ... I'll rip it out! I also added you as a link .. perhaps you might reciprocate. Very interesting blog you got there .... keep up the good work! I added you to the blogroll. It is always fun to see the variety of Dylan covers. Some are great, some so bad it is entertaining in itself. Thank you for this nice collection. Always enjoy Dylan covers, so thanks for this compilation. The same goes for the interesting & amusing commentary. So much bad and good within the frame of one song - a-mazing. Glad the the comp and the "liner notes" were appreciated - it's incredible how much time that song occupied in my life till I finished that damn post.